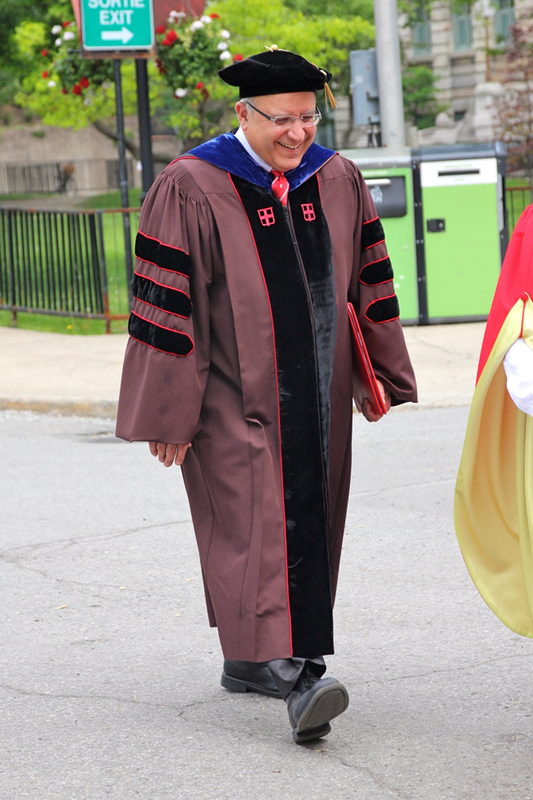 Provost Anthony C. Masi’s second five-year term comes to an end June 30. He will be succeeded by outgoing Dean of Arts Christopher Manfredi. Masi has spent 36 years at McGill, as a Professor of Sociology, as Chief Information Officer and as Deputy Provost and Provost. As Provost, Prof Masi has had oversight for both the McGill’s academic mission and the University’s budget. He sat down with The Reporter for a look back and a look ahead. You’ve been Provost for 10 years, and before that you were Deputy Provost and CIO. What accomplishment has given you the greatest satisfaction? The most satisfying thing about the job of Provost over the last 10 years has been the opportunity to be involved in the hiring of over 800 professors. That’s 800 new people we brought to McGill. Most of them are still here. That was a really exciting part of the job, being able to contribute to academic renewal. The only way I was able to do that was to make sure the academic mission was the primary driving force behind the budget. 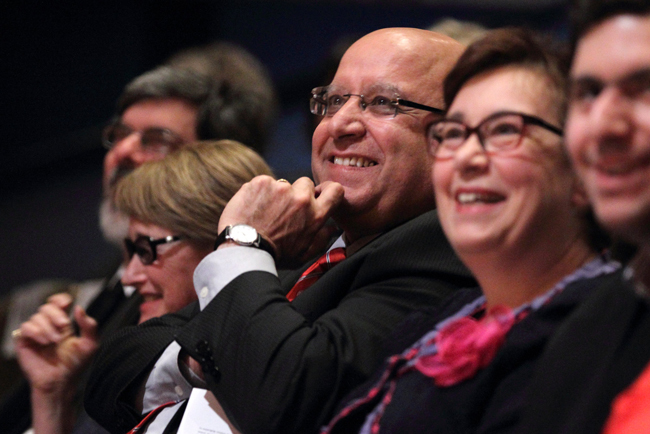 At McGill, the Provost is delegated by the Principal to be the chief academic officer and the chief budget officer. That means that our academic mission drives all of our resource-allocation decisions. We certainly recognize that to fulfill our academic mission we need good facilities and infrastructure, so obviously we make allowances for that. It’s not that you abandon the other things, but you put them in perspective. We need new IT systems, for example, and we need to renovate our libraries. But, how we choose to do those things depends on our academic choices. In the end, the job of the Provost is about making sure that you have a professoriate at McGill that can compete with the best in the world. And if they can do that, then that will help us continue to attract the best students in the country – I think among the best on the continent – to come to McGill. And they will then become ambassadors to others to encourage them to come as long as our professors keep producing. We think of it as a virtuous cycle in which these investments have been made. We’re up probably close to 400 professors (net) over that time period as well, so, yes, that’s been pretty satisfying. I think another major issue has been how we have improved our performance. Thanks to University Advancement and the Deans of the Faculties working together, we have established over the last decade 54 endowed chairs. So I’m pretty happy with that, too. It’s important because to be internationally competitive, we cannot rely exclusively on the Quebec government for the funding of our professors. … Over the last decade, I’ve been able to appoint 96 of the 122 Canada Research Chairs, and we’ve reappointed 37 of them. We’ve really built up the James McGill and William Dawson internal chairs, and I’ve appointed 80 of the 157 people who hold them. So, I’m pretty happy with the academic renewal record in general. I think one of the most satisfying moments for me as the Provost was actually when Suzanne Fortier, in her first year, read my two strategic papers, particularly the last one, ASAP, and said there was no reason for McGill to launch a brand new strategic exercise until this one had terminated because it was very good. And then she chose five themes from that strategic paper to be her Principal’s priorities. And we’ve been ranked No. 1 in Maclean’s for the past 10 years, the time I’ve been Provost. You don’t live and die by the rankings, but it’s nice to have the external recognition for the things McGill has accomplished. Also, during your decade as Provost, there must have been some things you wanted to get done but weren’t able to because of external or internal circumstances. Is there anything in particular that jumps out as something you wish you’d been able to get done but couldn’t? I think there are a couple of things I would have handled but did not get around to addressing. The next Provost and the Principal will definitely want to deal with them. McGill’s accounting system and our chart of accounts – which are the responsibility of Financial Services and VP (Administration and Finance) – affects the way in which non-financial experts can manage their accounts. Michael Di Grappa and I have worked hard for the last couple of years to integrate our financial and budgeting systems, but one of the things we never got around to was fixing, simplifying, and clarifying the chart of accounts and our whole fund structure so that McGill’s accounting system would be accessible to all the non-financial people who become Deans or Vice-Principals. I think our budget is now readable without the help of an expert and I want our financial reports and financial statements to be readable as well. I think there’s still a lot of complication in the system. Michael Di Grappa was making fun of me the other day at an event and he noted that I say three things all the time – and he captured it. I believe that these things are really important. The first is that when we say at McGill that this is what we want to do, I joke and say, you know, ‘that’s etched on ice, it’s not chiseled in stone’ – because our situation is so volatile. And I think that’s an important thing to remember. Nothing we do should take on the air of permanence because there are so many variables that can change it; we have to be able to make changes quickly. Then the second thing I say is an expression my wife taught me when I was learning Italian. Actually, it was my mother-in-law who said this phrase in her dialect and I loved it: ‘The wax on the candles is melting, but the procession isn’t moving.’ So if you have the image of people holding candles and the wax is dripping down, and nobody is walking, that means you’re burning up your energy and you’re getting nowhere. And that is another kind of typical response at a university. We’re far too slow, we don’t respond as quickly as we should, and although I think we’ve made progress, I think that is still true. The third thing is that people tend to think that technology will make a difference, in their lives – and for a little bit it can. But if you don’t change your processes then instead of building a superhighway, you’re just “paving a cow path”. So I use those three phrases all the time. When I see things at McGill that we should be doing faster and better, more efficiently, and with gusto, but instead we’re holding back progress, meandering about, or hiding behind “our way of doing things”. We have made progress, don’t get me wrong, but there will always be the need for improvements, more flexible, and quicker ways of doing things. We certainly have and will continue to experience transformational moments, but we also have to focus on continuous incremental improvement, what the Japanese call “kaizen” (change for the better). Universities, and McGill is not unique among them, have often been seen as hidebound institutions, sometimes accused of resting on their laurels. What are your thoughts on this? I fought for 10 years – in the white paper and in ASAP, and with consultations with the community – to fight this perception that McGill was resting on its laurels. In fact, I kept saying, and the paper is filled with it, ‘you can’t assume that what made us successful yesterday is going to make McGill successful tomorrow.’ So we had to think differently … Indeed, while McGill administrators in the past had thought and acted strategically in the past, we had never written and implemented a strategic plan before. McGill is actually a very innovative university. We’ve done a lot of amazing things with curricular reforms in almost all of our Faculties, and we continue to attract really high-performing professors and amazingly talented students. But there are two things we haven’t done as well as I would have liked: the first is linking the empirical indicators of our performance back to all of our resource allocations; … And second, I think our budgeting model is still a bit heavy with the “history.” We’ve been trying to make performance, resource allocation, and budgeting smoother, more transparent, more efficient, and a lot simpler, but without an even closer integration of planning, budgets, and finances that won’t happen. So one of the things I’m leaving for Chris Manfredi is a plan for the unification of the Office of Planning and Institutional Analysis and the Office of the Budget and some ideas about how the Office of the Associate Provosts can be reworked to accomplish these tasks effectively and with clarity. On the information systems and technology front, I think we were ahead of every university in Canada in the mid-2000s in vision and implementations. We went client-server relatively early, and now we’re moving into object-oriented programing and service oriented architectures. We’re ready for this, but haven’t gotten there yet because over the last 10 years, we’ve turned our attention to other pressing issues and haven’t done the hard work keeping our information systems and technologies up to date. Because we want to accomplish reductions by means of attrition and not layoffs, the remaining staff will have to work smarter. Based on the experience of the voluntary retirement plan, they can and they are doing just that. They are smart enough and motivated enough to do this. We have to find ways to keep them up to date and trained and moving along a stratifying career trajectory. The new modules that are being designed for the HR information system will include a lot of features for encouraging and measuring skills development. … In the past, we would just add another person, and we never thought about changing our processes. Michael Di Grappa’s team, working closely with Provost-designate Manfredi and the Deans will be working on continuing the integration of budget and finance and on turning “My Workplace” from a project to a reality. They will be redefining and redesigning the way administrative and support staff help McGill achieve our academic mission. Of course, you want to have innovation and experimentation in local areas because if it works well in one place, then you want to be able to do it somewhere else. If you try to do it all from the centre, you will make the mistake of overreach and you will impose inefficient solutions in certain areas. We often speak of centralization and de-centralization, but we really should be working more in a federated model where common objectives, goals, and priorities can be achieved even if we use slightly different approaches. We hear a lot about the demographic challenges Quebec faces in terms of an aging population and not replacing the working-age population rapidly enough. This will continue to put a strain on the province’s finances as health-care costs continue to rise and supporting taxable incomes fail to keep pace with the needs. Does that mean the university sector is facing at least a decade of continued low funding? There are two hidden questions in there. The first is a division between empirical fact and policies. Policies have two dimensions, politics and good public policy. Let’s assume that we can agree on the empirical facts. And that’s not always easy. There has been a decline in the number of births in Quebec sufficient to indicate that the school-age population and the school-leaving population eligible to come to university will be declining over time. It’s really simple, if you think about it. We know today how many Quebec-born people are going to be eligible for school, high school and CEGEP for the next 20 years. And that number is not adequate to fill the spots that are already available. Immigration can make a difference, but we know that most immigrants come to us once they’ve completed their formal education. And even those who come with families are sometimes simply replacing the Quebecers who have left to go somewhere else. The numbers are not encouraging on the demographic side. The general trend, in terms of the school-age population, has been down. You hear about it all the time, particularly in the Anglophone community because English schools are consolidating or closing because most immigrants are not eligible for instruction in English. The government now appears to want to reduce the number of people it educates to a Bachelor of Education degree, which is another indicator that they think they’re producing too many teachers. The Quebec government has a debt-to-GDP ratio that’s three times McGill’s. We’re in much better financial shape than it is. Quebec has a huge accumulated deficit to Gross Provincial Product. That number is European level, it’s not North American level. I think it’s one and a half to two times higher than any other province in Canada. Will the government be in a position to provide additional resources to universities? … I think there is a crunch on Quebec that is significant and will last for some time. Unless the working age population increase due to immigration and earning rise enough to significantly increase government tax revenues. What’s McGill’s fundamental problem in Quebec? Our fundamental problem is that we have found mechanisms to excel, notwithstanding the chains that are wrapped around our ankles and wrists. We’re able to do things because we have great alumni, we have the ability to attract outside funding – and we’re actually paying a price for that in Quebec. But so far, we have been able to generate slightly more than we lose, but this is very tenuous. Will there be a time in the next decade when the government reinvests? Politics. Notwithstanding the deficit, notwithstanding sound public policy, in order to win elections, they probably will reinvest – not in the next two or three years, but sometime before the next election. But I would not anticipate a major reinvestment. Will they follow sound public policy? Probably not, although, I think Suzanne Fortier is already doing a spectacular job in rallying the universities in Quebec to a position of ‘we need to help ourselves; you can compete. We shouldn’t just be about being assisted, we should be assisting.’ And I think that’s a great way to think of it. Universities should be doing more for themselves and that means dealing with their individual student bodies differently. We’re not all the same. Not all universities are the same, but the government treats us as if we were the same. In fact, they treat some of us worse than others. How important is the Royal Vic project for the future of the University? It depends on who you ask. You need to consider two things: First, McGill is squeezed between a natural historic, heritage site, which is Mount Royal Park, and a downtown that has just had its zoning requirements changed with regard to height and density restrictions. So if we wanted to expand near our campus and we wanted to do it not by going onto the mountain (where we already live) it would cost a fortune. Downtown real estate is much more expensive now because of the removal of height and density restrictions. So real estate south of Sherbrooke St. is much more valuable now than it was five or 10 years ago. The Royal Victoria site is natural for McGill only because it’s next door. If the Royal Vic were Hôtel Dieu, I wouldn’t be answering your question, because you probably wouldn’t have asked it! We probably wouldn’t be interested in going all the way across Park Ave. But the Royal Vic touches McGill. I know this is still in debate, but there are parcels of land on which the Royal Vic was built that were part of the original James McGill deeds, and we have a long-term lease on the Allen Memorial Institute and we have the Ludmer Building to the west of the old hospital. So we’re on the site already and we will remain as long as we can. In fact, the RVH is already a great part of McGill’s history. … We could make great use of that facility. We have space needs that have gone unmet, space needs that the government recognizes as legitimate needs. But the government is sometimes difficult to deal with on these dossiers. Before we can make any commitment, we have to do the feasibility studies and we have to be in control of those analyses. V-P Di Grappa’s team and a planning committee with lots of academic involvement will get us on the right path. If the government decides or we decide that we cannot make use of that property, the feasibility study stays with the government and the government can do what it wants with that property and we get our share of the investment to that point back. But we have to have a logical progression, and it requires a functional and technical plan at a level of physical planning that we haven’t engaged in in years. In other words, what would go there? If we take it over, what units would go there? Why would they go there? What benefit would it have to the educational mission of the university? What’s in your future now? I will be taking a sabbatical. I’m going to use the time to gear up again to be a professor. I have maintained my interest in demography, industrial organizations, and the study of the labour force and labour market. One of my projects will be to prepare a MOOC [Massive Open Online Course] on population and society. … It’s been a great 10 years for me. I’ve said to people before that being the Provost is a difficult job, but it’s also a very rewarding job. And the most rewarding thing is that every single day I come to work I learn something new. And there have been very few days when I learned something I didn’t want to know!